ZDDPlus™ is the ONLY antiwear ZDDP component which re-establishes the ZDDP levels our classic car’s engines were designed for, while allowing the car owner to use the base oil of their choice. The ultimate cam assembly lubricant! Protects cams, lifters, and other valve components during initial startup. Use during engine assembly on cam lobes, lifter feet, push rod ends, rocker balls and valve tips in any internal combustion engine. Your classic car means everything. You patiently restore every part, turning a vintage automobile into a gorgeous hot rod that inspires admiring whistles from onlookers. As an experienced car collector, you treat your vehicle’s engine as more than simple automotive hardware; it’s the lifeblood that keeps your 1969 Boss 429 Mustang or 1966 Shelby 427 Cobra running in peak condition. You always give your classic car the tender care it deserves. So do we. ZDDPlus™ is a precision zinc oil additive that offers optimum protection for high-performance classic engines. Premium lubricants have always contained unique engine oil additives designed for important engine components. Heat stabilizers, anti-foam additives, detergents, dispersants and anti-corrosion additives work harmoniously to safeguard engines from ash and contamination. ZDDPlus™ gives your classic car the zinc and phosphorus lacking in today’s oils, geared directly to top-quality older car engine maintenance. Enjoy smooth cam shaft break in and incredible performance every day afterwards. With ZDDP in additive form, you have complete control over your preferred oil for optimum viscosity and lubrication. Creating a way to safeguard your vehicle’s engine isn’t just an interesting side project for us – like it is for many oil manufacturers – it’s what we’re passionate about. As fellow car collectors, we love the roar of an engine in peak condition. Your vintage automobile deserves the best; use ZDDPlus™ to give it optimum protective lubrication. Check out our car collector white papers for tech specs showing the benefits of ZDDPlus™ for classic cars with flat-tappet lifters. For additional tips and questions, contact our experienced Z DD Plus staff at 650-409-7587 or by using our online form. ZDDPlus is the original, best researched and documented cam wear solution available. 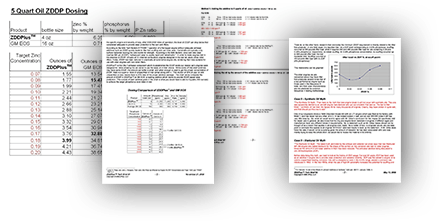 Why Is ZDDP Essential for Classic Car Engines? Put simply, modern cars and camshaft systems are built differently than the masterpieces of the 1940s–1970s. Today’s vehicle manufacturers use roller lifters instead of flat-tappet lifters because of emissions and profit concerns. Roller lifters have lower friction variables, so modern oil formulations contain minimal ZDDP. They’re great for today’s everyday automobiles, but lead to serious risks for classic car engine longevity. A big part of driving a vintage vehicle means preserving its factory parts and original performance specs. Having a source of additional zinc and phosphorus in classic car motor oil is vital. We use ZPlus on all of our Flat Tappet built motors. ZDDPlus is the best insurance to protect your classic or high-performance flat-tappet engine! ZDDP stands for zinc dialkyl dithiophosphate. This compound has significant engine protection characteristics, especially for high-performance motors. ZDDP coats flat-tappet lifter and cam contact points with a durable shield that protects their ductile underlying metal. To guarantee long and healthy engine life, keeping these contact points safeguarded against friction, wear and damage is critical. 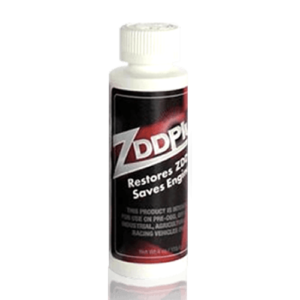 ZDDP is considered the gold standard for collectors’ engine protection. Zinc and phosphorus in modern oils amount to a mere 600 or 800 ppm. By adding the proper amount of ZDDPlus™ you will be able to give your camshafts and lifters the correct amount of ZDDP they were designed to operate with, ensuring an optimum coating for long-lasting engine performance. Far superior to modern engine oil, with better viscosity control than racing oil. More available anti-wear ZDDP than diesel oils. Carefully balanced for premium results.